After some very clever shooting by Miss Annie Oakley, who seems to be a feminine Dr. Carver, and illustrations of "cowboys' fun" in throwing the lariat, and picking up objects from the ground while riding at full speed, the audience were treated to a spectacle of some very clever riding, several members of Buffalo Bill's troupe mounting bucking horses and ponies, which dash about in a manner which threatened to dislocate their own backbones, and much more to injure anyone who dared to try to ride them. In almost every case, however, the cowboys were successful in mastering their steeds. 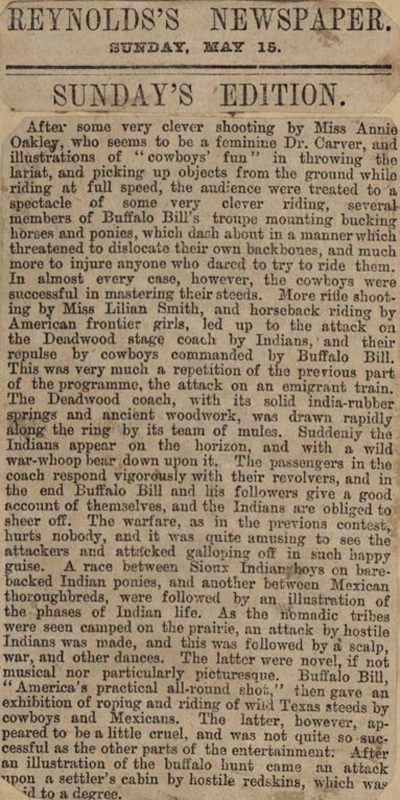 More rifle shootings by Miss Lilian Smith, and horseback riding by American frontier girls, led up to the attack on the Deadwood stage coach by Indians, and their repulse by cowboys commanded by Buffalo Bill. This was very much a repetition of the previous part of the programme, the attack on an emigrant train. The Deadwood coach, with its solid india-rubber springs and ancient woodwork, was drawn rapidly along the ring by its team of mules. Suddenly the Indians appear on the horizon, and with a wild war-whoop bear down upon it. The passengers in the coach respond vigorously with their revolvers, and in the end Buffalo Bill and his followers give a good account of themselves, and the Indians are obliged to sheer off. The warfare, as in the previous contest, hurts nobody, and it was quite amusing to see the attackers and attacked galloping off in such happy guise. A race between Sioux Indian boys on barebacked Indian ponies, and another between Mexican thoroughbreds, were followed by an illustration of the phases of Indian life. As the nomadic tribes were seen camped on the prairie, an attack by hostile Indians was made, and this was followed by a scalp, war, and other dances. The latter were novel, if not musical nor particularly picturesque. Buffalo Bill, "America's practical all-round shot," then gave an exhibition of roping and riding of wild Texas steeds by cowboys and Mexicans. The latter, however, appeared to be a little cruel, and was not quite so successful as the other parts of the entertainment. After an illustration of the buffalo hunt came an attack upon a settler's cabin by hostile redskins, which was id to a degree.